I am a baby wearing advocate, and no, I never needed to take Motrin as a result of baby wearing. I understand baby wearing is not for everyone, but I loved wearing my children and wore them year round on my daily hikes. In the winter, I would try to bundle them up, and I felt my body heat was keeping them warm, but I wish I would have had the Peekaru. What is a Peekaru? 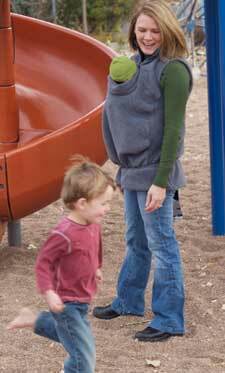 Peekaru is essentially a fleece vest you wear over a soft baby carrier, such as a Baby Bjorn or Ergo Carrier. The fabric is stretchy, so it fits comfortably over you and your babe, and best of all, the fleece is made from 85% recycled material! Made from 85% recycled high quality Polartec fleece, each Peekaru Original saves approximately 25 plastic bottles from reaching the landfill. In addition, Polartec fleece is Oeko-tex Standard 100 “for textile products of all types which pose no risk whatsoever to health.” Feel good knowing that while you are holding your baby close, you are also helping the environment. My children are too big to wear (that would require something stronger than Motrin), but I did try the Peekaru on with a baby doll. I found it very easy to put on, and I felt very warm and comfortable. I really wish I would have had this product when my children were younger! For winter hikes, I used to bundle my kids up so much that they barely fit into the Baby Bjorn. The Peekaru is a much more comfortable solution to wintertime baby wearing then five layers of clothes! This makes me want to have another baby. Some of my fondest memories of early motherhood were the hands free walks I had with other baby wearing moms. I used to tie a big blankie around us in the winters, but this is ideal! I agree completely Tara. I miss my baby wearing days!